Every industry is susceptible to disruption by ecosystem plays—and those who aren’t ready are at risk for value degradation. Accenture’s Disruptability Index, which shows that di erent industry segments within the same sector may experience varying periods of disruption, found that more than 40 percent of companies across 20 industries are highly susceptible to future disruption. This accounts for a combined enterprise value of US $26 trillion. 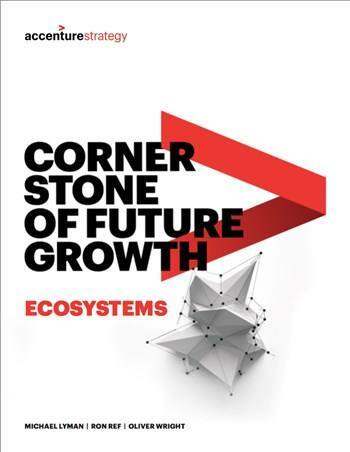 Accenture Strategy surveyed 1,252 business leaders from diverse industries across the world to better understand the degree to which companies are capturing ecosystem opportunities. We found companies are pursuing new business models to navigate, or even lead, disruption. When asked what they would typically do to disrupt their industry, 60 percent of executives said, “build ecosystems.” Nearly half have already built or are currently building an ecosystem to respond to disruption. Why? Ecosystems are proving to be winning plays. Enabled by digital platforms— ecosystems could unlock $100 trillion of value for business and wider society over the next 10 years.